The Women’s Rugby World Cup 2017 Asia/Oceania qualifying tournament begins on Friday where Hong Kong, Fiji and Japan will compete for the final two places on offer in Ireland next year. The 12-team line-up for Women’s Rugby World Cup 2017 will be confirmed over the course of the next eight days as Hong Kong, Fiji and Japan compete for the final two places at next year’s showepiece event in the triangular Asia/Oceania qualifying tournament. The top two-placed finishers from the tournament will go through to the WRWC 2017 in Ireland as Asia/Oceania 1 and 2. The winning team will take the spot reserved for Asia/Oceania 1 in Pool C alongside Women's Six Naitons champions France, Ireland and Australia, while the runner-up faces Pool A games against WRWC 2014 finalists Canada, the world’s number one ranked team New Zealand and Wales. All three matches are to be played in Hong Kong, starting on Friday with a clash between the host nation and Fijiana on pitch one at the King's Park Sports Ground. Four days later Japan play Fijiana at the same venue, before the concluding match sees Hong Kong up against regional rivals Japan at the Hong Kong Football Ground, on 17 December. Japan are the only one of the three nations bidding to claim those two qualification places to have participated on the Women's Rugby World Cup stage before, albeit not since the inaugural two tournaments in 1991 and 1994. 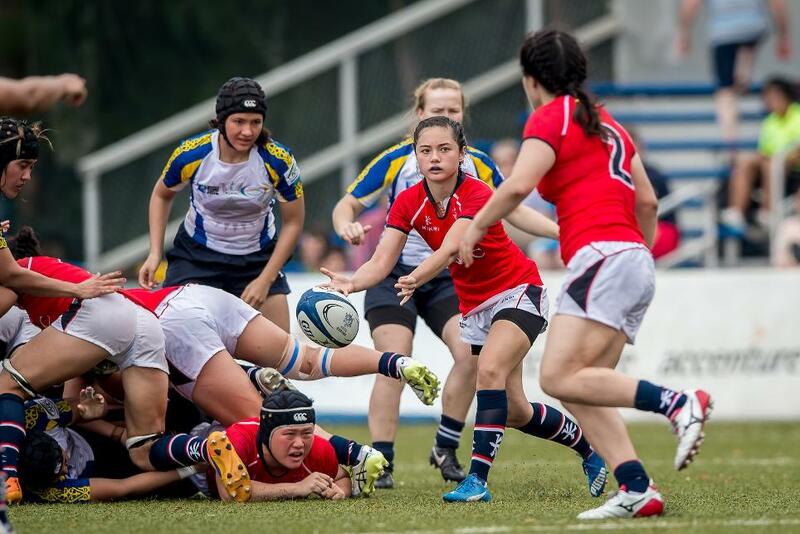 Hong Kong, however, go into the tournament in buoyant mood after a build-up campaign that was unprecedented in its scale and intensity, with two training matches against Kazakhstan – Asia's regular representative at Women's Rugby World Cups – last month. Hong Kong won both, winning the second match impressively, 37-10. “I was pleased with the Kazakhstan games, but we still need to play 20 per cent better against Fiji to get the result we’re after. Kazakhstan are good and playing against them showed us we still have some things to work on to be ready for the coming matches, particularly our commitment in the tackle area against bigger players and that is something we are focusing on,” admitted Hong Kong coach Jo Hull. Despite the absence of some multi-capped players, Hull has been able to select a highly experienced group with 25 of the 26-strong squad capped previously, including 21 players from the tour of Spain last December and the Asia Rugby Championship earlier this year. Fiery young scrum-half Jessica Ho Wai-on (pictured) is the only uncapped member of the squad. Hull says that qualifying for their first-ever Women’s Rugby World Cup would be another sign of the progress made by Hong Kong in women’s rugby. “I’ve seen a huge turnaround in women’s rugby since I arrived 18 months ago. At a national level, we have grown from a six-week to a 10-month programme, with regular analysis and a big emphasis on strength and conditioning. The players have really bought into that and I think we are starting to see the first glimpses of results now,” she said. "Going to a World Cup is an experience you will never replicate in any other part of your life. When and if we get there, these girls will give their heart and soul to every minute of that and that is all that you can ask of them"
Twelve members of the Hong Kong sevens team are included in a squad that is once again captained by inspirational second-rower Chow Mei-nam. And Hull, who has been on the Scotland coaching team at previous World Cups, believes this group of players has what it takes to get to the next level and will produce a performance that will make Hong Kong proud. “Going to a World Cup is an experience you will never replicate in any other part of your life. When and if we get there, these girls will give their heart and soul to every minute of that and that is all that you can ask of them,” Hull said. With the top two teams advancing, a win over Fijiana would be a huge step towards Hong Kong booking their ticket to Ireland 2017. But Hull is aware that the Pacific islanders will present a stern challenge after reviewing footage of their Oceania Rugby Women’s Championship 37-10 win against Papua New Guinea in early November. “Fiji are big and strong and we know that it won’t be a walk in the park against them,” she said.